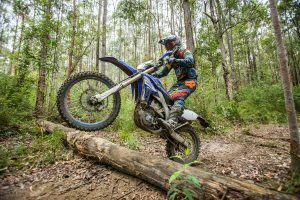 Yamaha Motor Australia recently invited MotoOnline.com.au to Bathurst for the release of the WR250F in conjunction with the Sunny Corner Trail Bike Ride and, while we were there, Yamaha allowed us to pilot the 2018 WR450F and test its slight revisions to an already outstanding package. Yamaha and the Sunny Corner Trail Bike Ride had set out a really neat grass track with plenty of tight off camber corners and hills, as well as a single trail loop to test out the bikes in a variety of typical Australian conditions. This is not our first time on the current generation WR450F either, last year we were fortunate enough to ride the 2017 WR450F at Sunny Corner Trail Bike Ride, as well as the release of the 60th Anniversary 2016 WR450F on a number of other occasions. If you are more fond of the larger-bore four-strokes, the Yamaha WR450F should certainly be on your shopping list. 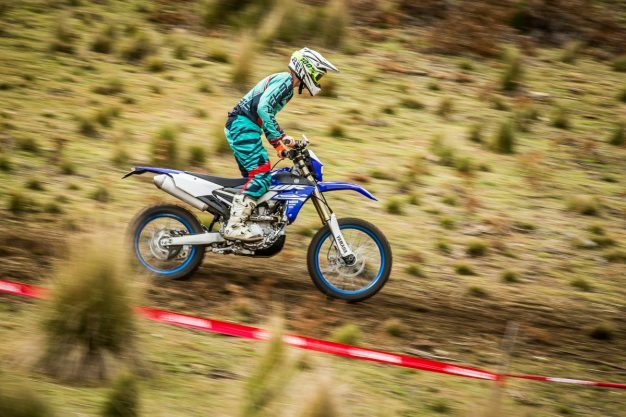 If you were a fan of the 2017 WR450F – which is Australia’s number one selling off-road model – great, because you will love the 2018 as it’s largely the same bike from the previous year with a few small changes. So what has changed? First thing that is obvious is the new graphics, of course along with new blue rims which falls in line with the rest of the 2018 Yamaha line-up. The kick-starter for 2018 has been removed, as more and more bikes have been running with the electric leg. With the improvement in battery technology in recent years, it makes sense that we can now ditch the kick-starter and save some weight at the same time. 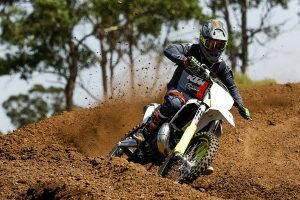 The KYB suspension has been modified slightly to benefit Australian riders and the internals have been refined including new oil levels and different settings for the Aussie bush. A new scraper has been added to the oil seal, which helps the fork with self-cleaning. Overall the feeling with the suspension results in better stability and control for the rider. 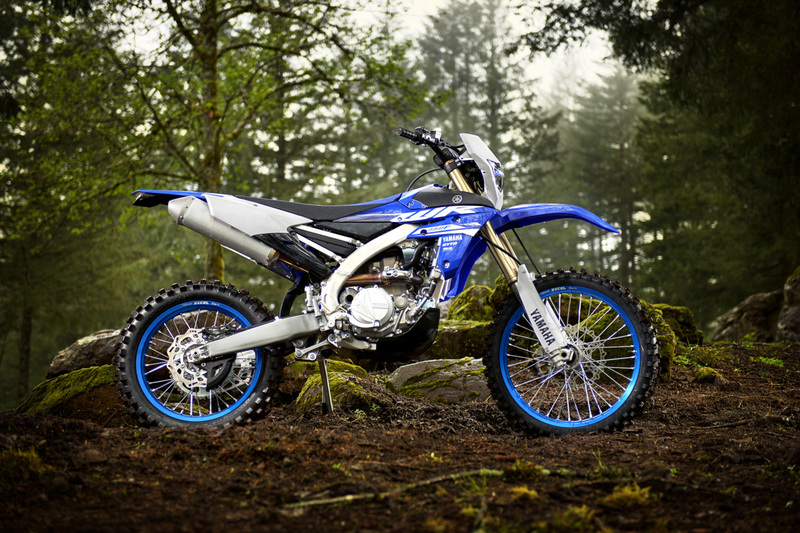 For an additional cost, the 2018 WR450F comes with an Off-Road Kit that boasts a new Polisport headlight, lightweight Barkbusters hand-guards, a lightweight tail light, hanger and brake-snake. Also for an additional price, the option of a Power Tuner to adjust the mapping for the 2018 WR450F is available. Mapping has been well set up for general conditions, however the ability to change mapping depending on trail conditions is a really good feature. The WR450F has power on tap, based heavily off of the previous generation YZ450F motocross bike, which is notoriously powerful, and with the availability of the Yamaha Power Tuner you can tailor the bike’s power to the track conditions exactly. We didn’t get much time to play around with that feature on this occasion, but on previous rides we have been able to. The 2017 Sunny Corner Trail Bike Ride was a little wet and tuning the mapping down for that occasion worked a treat. The 2018 WR450F is marginally lighter than the 2017 model, but riding the bike you really didn’t get a sense of that. Still, it may assist in reducing fatigue over the long haul. Ergonomically the bike feels very comfortable, the seat height in relation to the foot-pegs and bars is very natural for someone of average height – nothing feels too out of the ordinary. The bars are able to be moved into four different positions giving you the ability to customise your ride set-up or, depending on if you’re riding more sand tracks, you could shift them back slightly. It’s always ideal to have the option. In terms of handling in this type of environment, the bike was spot on. In the tight and off camber corners the WR is noticeably more sluggish to maneuver than the WR250F, but that is generally what you expect from the bigger brother. A few more kilograms to throw around and the added inertia from the engine creates that effect, but onto the open straights and more flowing trails the bike really feels at home and is a cinch to ride. 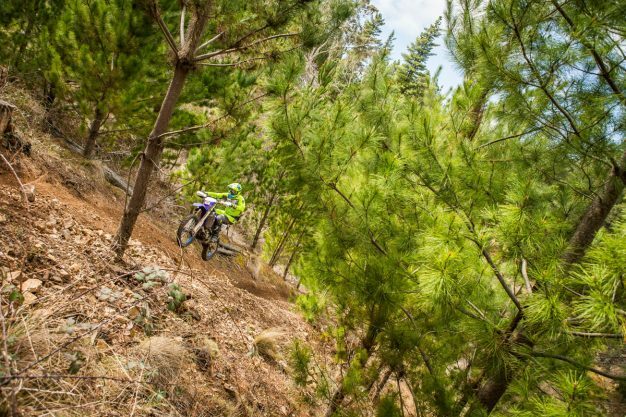 A strong, confident feeling and no surprises from the suspension really allows you to drop the right wrist further. The 2018 WR450F is available from mid-late October for $13,199. 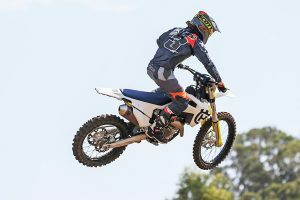 Further information on Yamaha Motor Australia’s WR range and complete specifications can be found on its official website at www.yamaha-motor.com.au.